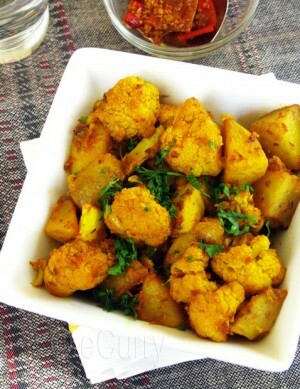 Cauliflower And Potato Masala recipe by Deena at DesiRecipes.com. Stir fried vegetables in ginger/garlic paste and spices. Cut cauliflower n potatoes in to medium size cubes n thoroughly wash it . Heat oil in a frying pan or kadai, add green chillies, ginger /garlic paste and stir for few seconds . Now add chopped onions n fry over medium heat until light brown . Add chopped tomato and green peas . Cook until tender . Add red chilli powder, cumin powder, turmeric powder, coriander powder, garam masala and salt . Mix well . Add cauliflower and potato stir saute for 5 min. Cover the pan and cook over medium heat until tender. Occasionally stir it to prevent sticking to the bottom. Serve hot and garnished with fresh green corriander. Really good. Will make it again. Only used 1/2 the chilis called for because we are Californians, and not used to really hot dishes. Thanks very much for the recipe... ALLAH aap ko khush rake... I tried to make right away and eat it... it was fantastic... hehe..... It was my first time cooking.... Thanks again.. and all the very best is the life.